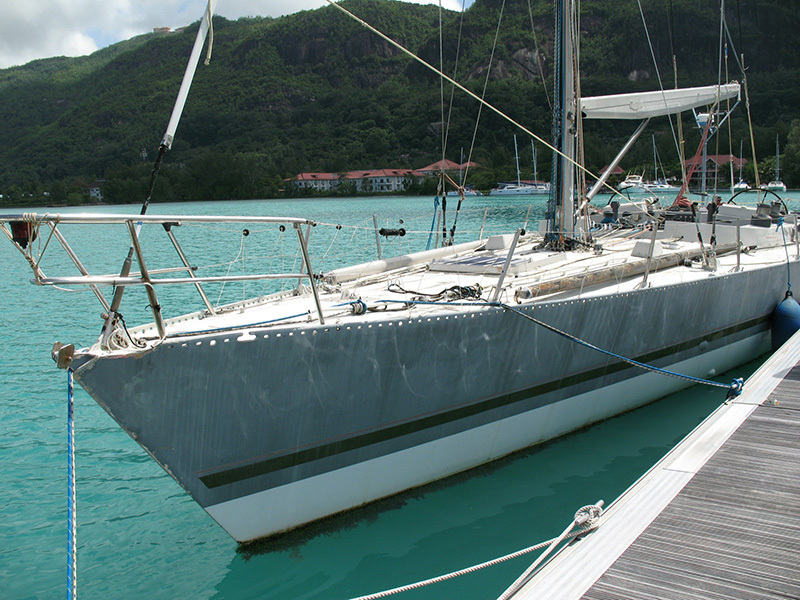 Tracy was forced to sell her beloved Maiden and at the end of the race and in 2014 the yacht was found rotting in the Seychelles, unloved and neglected. Tracy vowed to rescue her and set about raising funds to buy her back. She succeeded in October 2016 then set about raising funds to ship her home. One evening Tracy had a call from HRH Princess Haya bint Al Hussein who had heard that Maiden was being rescued. HRH vowed to help and through her generous support and in April 2017 Maiden was shipped into Southampton. 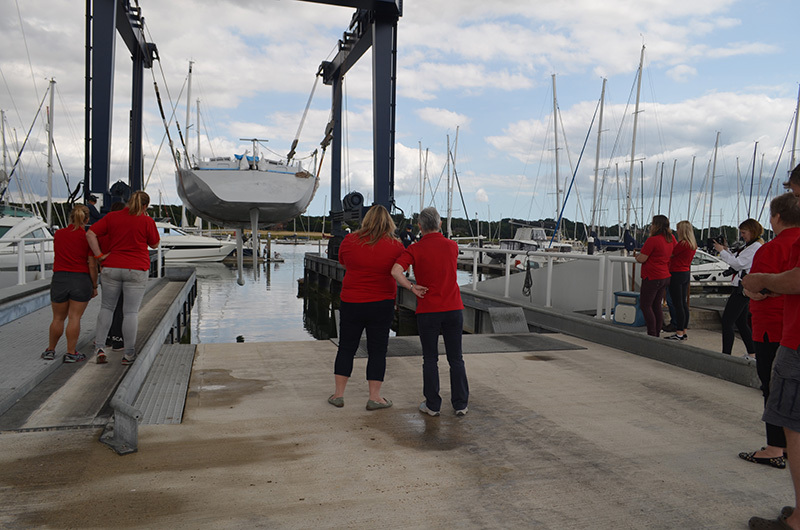 Tracy set up The Maiden Factor and in May 2017 the extensive restoration project began, in the same she in Hamble where she was refitted 30 years ago. Firstly, everything was stripped from the deck and interior and sorted into what was salvageable and what was not. Then the whole hull inside and out was shot blasted to remove all the filler, paint and insulation foam. When Maiden was stripped bare the full extent of the damage to the hull was exposed and it was horrific. The team could barely believe that she had floated at all with such damage to the hull. In July 2017 scaffolding was erected around Maiden and the cutting out and welding of new plates began in July 2017 and continued until December which was two months longer than expected. 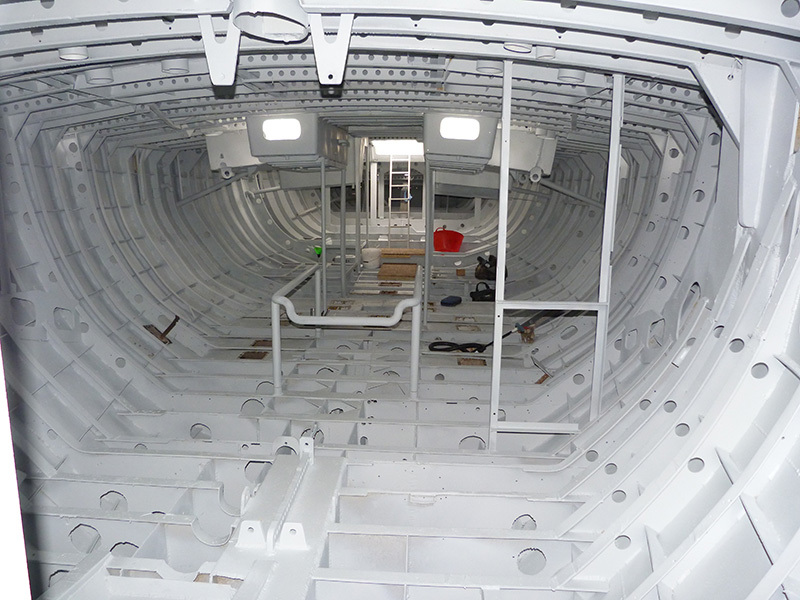 Then the hull was primed and work on the interior, keel, bulb and rudder began. 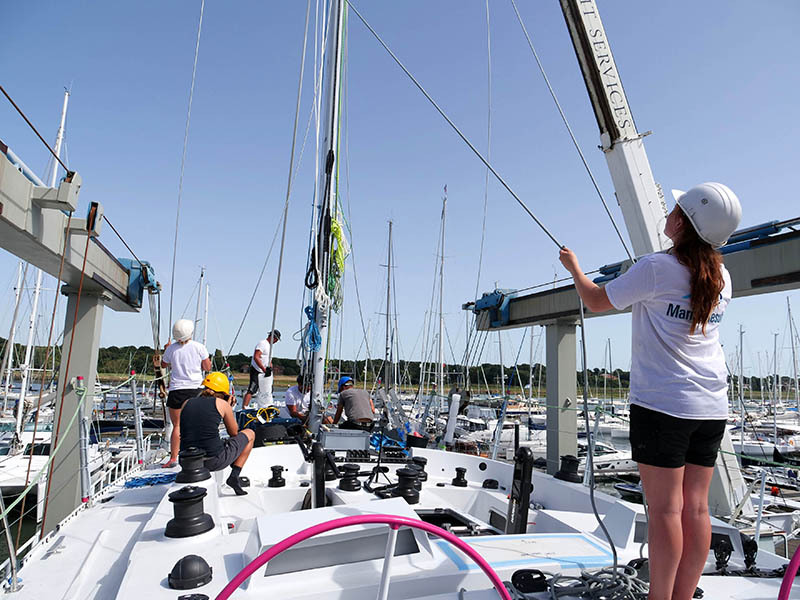 The Naval Architect had to re-design Maiden so that she would look the same but be easier to sail with less crew. All new parts were ordered and the team started to grow. By the Spring of 2018 Maiden was ready for the restored and new equipment to start being installed. The mast was being built in Gosport and was to be an exact replica but made of carbon which is stronger, lighter and safer. 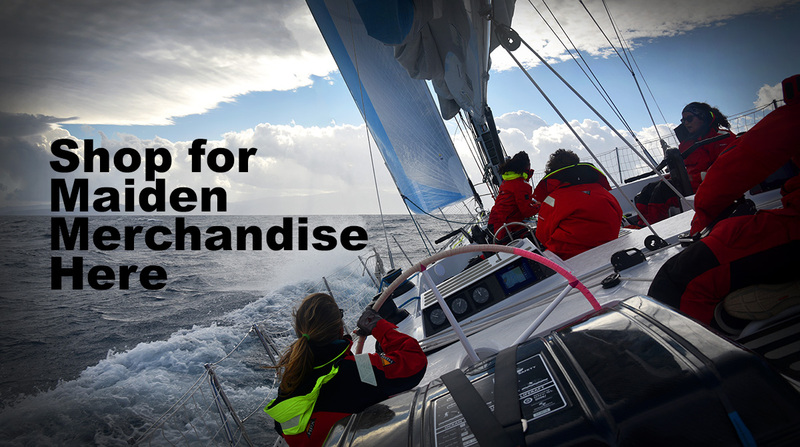 The new sail wardrobe was ordered along with new winches, navigation equipment, galley, head, engine, generator and water-maker. Boat safety gear has been a big priority as Maiden now falls under the Code 0 rule as she will be taking paying guests to raise funds. Crew clothing and crew safety equipment is all top of the range and certified. On 6th August Maiden came out of the shed, two days shy of when she first went in and was launched. Many people from Hamble and everyone in yard came out to watch and she looked stunning. However, there was still much work to do commission all the equipment and at one point there was 35 people working on the 58ft Maiden. The new crew had joined and were also working on getting her ready and the first three guest skippers, Dee Caffari, Wendy Tuck and Nikki Henderson have carrying out sea trials and safety checks in line with the Code 0 certification which is required before she leaves, from the Southampton Boat Show on the first leg of her world tour at 2pm on 22nd September 2018. 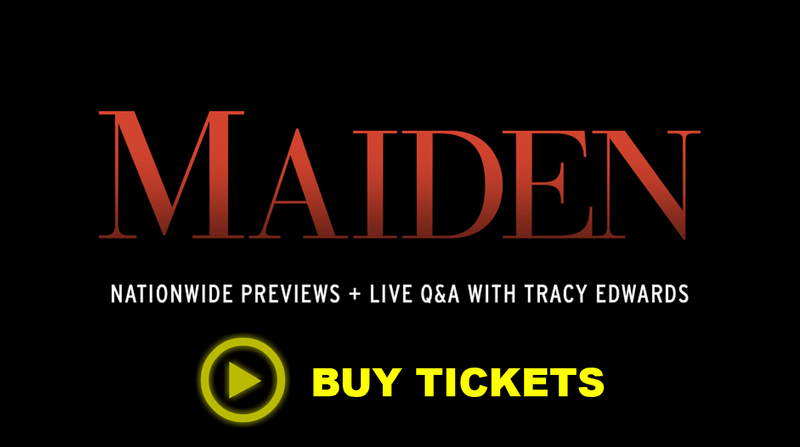 Maiden inspired a generation and now she has a new mission; to raise awareness and funding for girls’ educational organisations through The Maiden Factor Foundation. 130 million girls around the world are currently denied an education and studies show that given 12 years of education, girls can change their futures, their communities and the world.